The “Paradise” in Arobes isn’t only a paradise for donkeys. 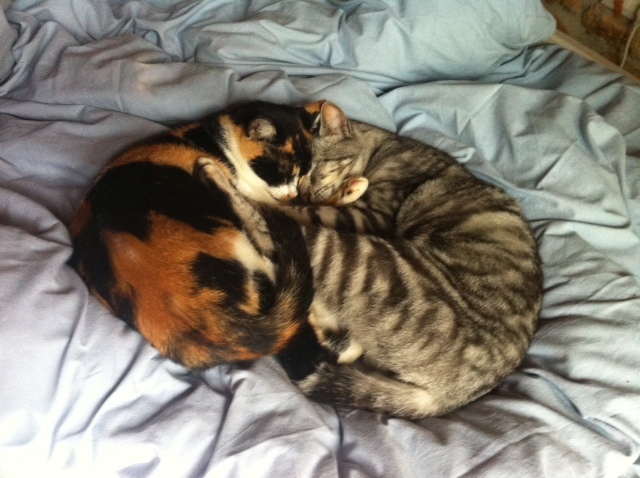 The first morning of my visit I found these two beautiful cats Pepper and Canela lying very comfortable on my bed. 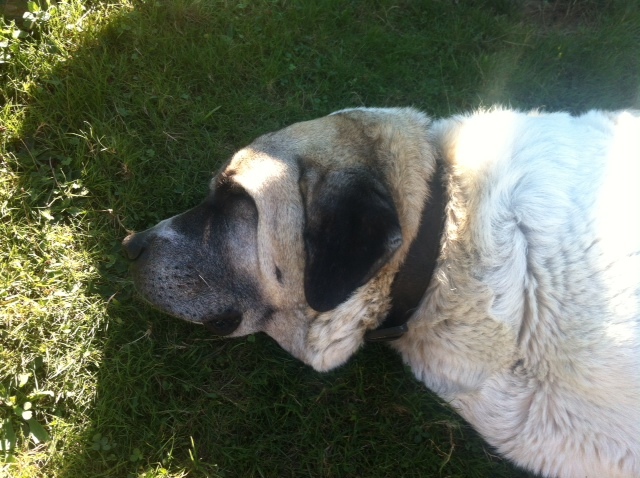 After a gorgeous lunch I sat down in the field and looked into the happy faces of Kari and Mara..
Then I felt something sitting beside me making a very happy sound..it was Arvo snoring. 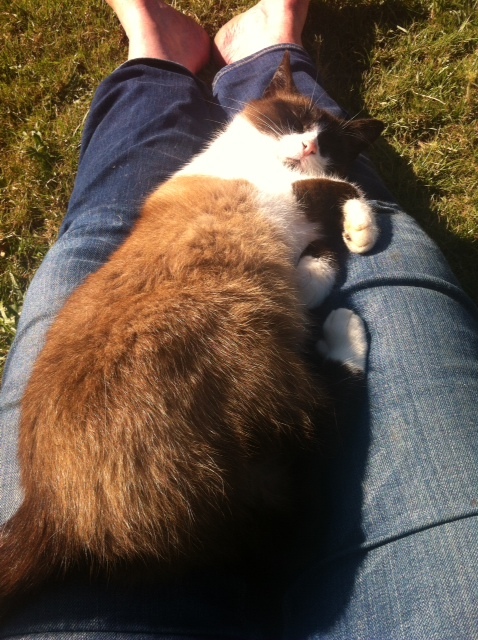 Running out of her space in the stables came Ronja and the sound of a purring cat joined Arvo. 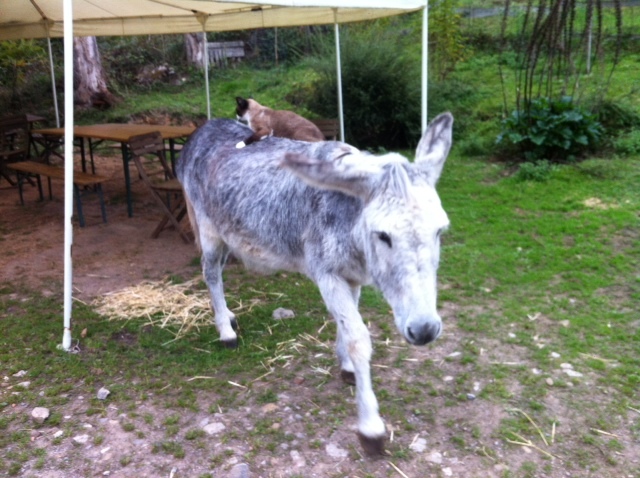 But of course do not forget the donkeys…here Rosie is taking Ronja for a ride though the garden.. This lovely video was taken by a visitor to the Open Day. There were no candles or wine at the picnic on our open day, but it really was a great party! My donkey friends, living in El Paraiso del Burro, were invited to eat at the table. You can see in the photos that it was all specially prepared for us. The only things missing were candles and wine! We have said that this summer we’ll have more donkey-parties and this pleases me a lot! But hopefully next time they might set the table with a little notion of donkey culture. We asses behaved in an exemplary fashion, as you can see in these photos. Had a great visit to the Donkey sanctuary in Asturias a couple of weeks ago. The surroundings there are breathtaking, set in a backdrop of mountains, valleys and lush meadows. The people there are very welcoming and hospitable, making it an extremely enjoyable and relaxing visit. Although the setting is tranquil the people do have a very important job to do and they work hard to look after the Donkeys. We took part in brushing the donkeys down which they seem to enjoy very much, waiting patiently until it’s their turn. They have a great peice of land to live and graze on and their quality of life is very good. I would recommend visiting the sanctuary to anyone. It was on a typical Zamora´s sunny November´s day that we got on the road to Asturias. We had left Asturias a few months previously and now we returned within 15 km of our old house in Cangas de Onís. We had an opportunity to get to know almost all of Asturias including the Picos de Europa, The Sueve and Cuera mountain ranges… but we did not get to know of this beautiful and sunny oasis within the green and fresh Asturias. I know I am going on… and yes we are talking about the Donkey Paradise. 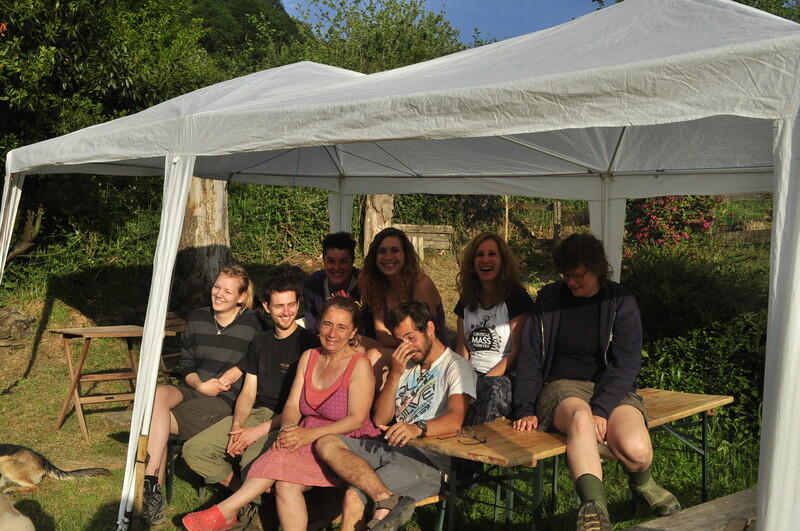 It was such a nice feeling to find ourselves during a downpour in the middle of a magical stable made into a kitchen, drinking tea with Marleen and all the other volunteers from Asturias and Madrid. The time spent during our life´s jurney at The Donkey Paradise has enabled us to spend days with people from the Canary Islands, Madrid, Germany, Holland and Sweden. We shared conversations in a unique and strange language that can only be understood here. We stayed in our caravan-suite with fabulous views. We would sleep with our dog Senda and some days we would be joined by Mama and Tito, our cats who are mother and son ; we also had a lots of staff. Each day would be unique, some were foggy while others may be sunny, rainy and on some occasions we even got up with several inches of snow. Imagine the silly slips we took ! What can we say about the donkeys? They are such an adorable animal and yet so stubborn and at the same time cute that in the end we came away loving each and every single one of them. Each donkey is like a friend, you can almost guess what they are thinking all the time as you form a close relationship with each donkey while staying at the sanctuary. To go around the 7 hectars of the sanctuary to collect the donkeys on a sunny afternoon is an experience that we will never forget. Our favourite donkeys are Juliet (for Estefanía) and Joep ( for Dani). Passing throught the sanctuary on our life´s journey has transformed us, we now are more tuned into animal welfare ; you must not forget that we belong to the same family, the mammals. During our stay, we lost two donkyes : Niño and Jelle. 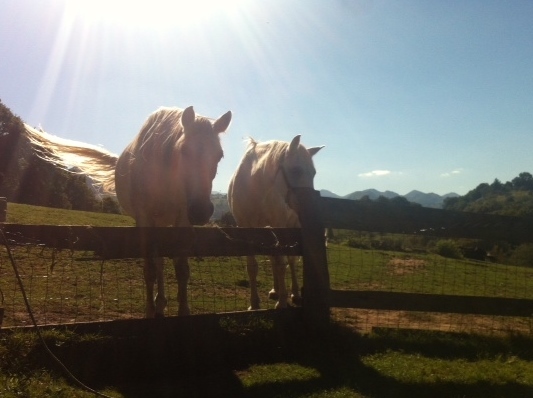 We hope that they find enough good grass in the paradise where they are now. We have even decided to stop eating meat, not a hard decission here at the sanctuary as all the meals are vegetarian if you so wish. Talking about food, it is such a wonderful experience to try the meals that Marleen, Tanja, Carla and other volunteers prepare. Well prepared vegetables are very nice… We also loved the bechamel and other sauces, we have even learnt how to bake bread and make home made yogurt. Work on the field is very pleasant and you are always in the company of other volunteers and the donkeys are never too far, there are also dogs and even some cats. Some volunteers will work erecting fences while other do the cooking or work in the vegetable plot. You can always pace yourself while doing the job as Marleen is always very happy if you take things easy. It is very pleasing to see people from nearby villages coming to help every week like Peter and Lynn or Joann. It is very satisfaying to see people helping and getting involved with the projects such as this. We are very pleased to have been part of it. 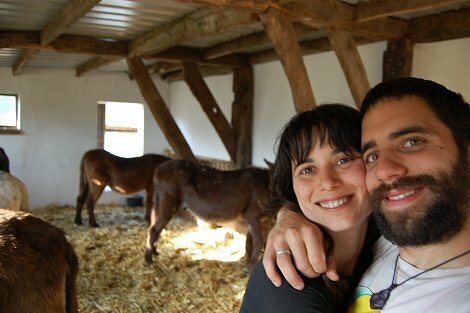 After 6 months, we now know that we like donkeys, love Marleen and all those who are involved with the project. We will return one day for sure. Love from Estefania and Daniel. Accompany us for a day at “Paraíso del burro”! Even if you do not have the possibility to come over to visit us here in Asturias, use your imagination and accompany us through our daily life! The first task of the day is giving the donkeys alfalfa and letting the four dogs out of their sleeping- stable. The breakfast, with freshly made porridge, is already being prepared in the living- room, where we take it together at 9 a.m. making plans for the day. After breakfast we let the donkeys out and prepare their stables, what includes spreading new straw, filling the water buckets and the strawracks. After the stables we take a coffee together on the terrace. After this refreshment everybody begins with the work she or he chose to do while staying at Paraíso. This can be fencing, working in the vegetable garden or building a compost boundary. Marleen or some of the volunteers choose to cook on this day so we can have our communal lunch at about 2 p.m. This could be a little appetizer like toasted bread with goat cheese followed by zucchini lasagna as main course. Salad, home made bread and cheese are always part of the lunch as well as a glass of wine for those who like it. Usually we end the meal with a cup of coffee. After that we prepare the donkey dinner that consists of a big bag of carrots and two kilos of apples, which have to be cut in small pieces. The time between lunch and donkey collecting is free time, so some of us choose to have a siesta, others go with the flow and continue working or go for adventure! Asturias is one of Spain’s most beautiful regions and full of hidden treasures like big forests, hidden beaches and abandoned crystal mines. At about 6 p.m. we collect the donkeys from the grazing land and control if they have enough water. We spread the apples and carrots between them; add grains and vitamins or medicine for those who need it. For dinner we halter the donkeys to secure that every one of them has the time to eat out of his own bowl. 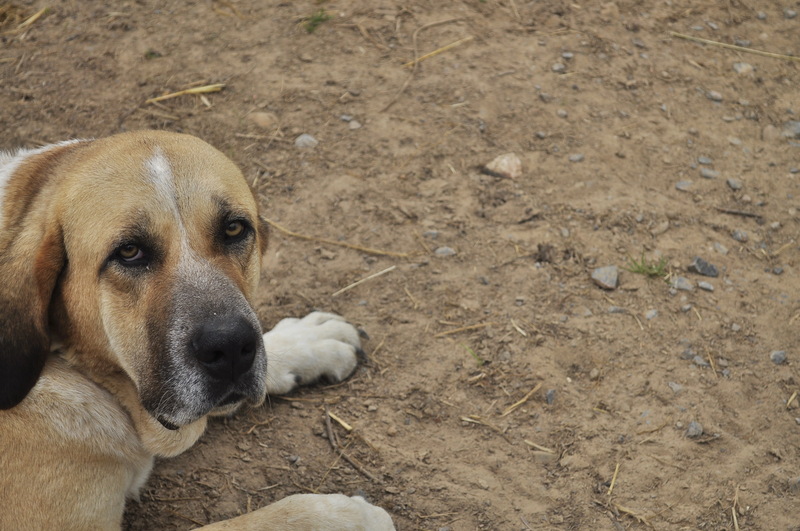 Also the dogs have to be closed in their stable and be fed, as well as the cats are given their food. A typical dinner at 9 p.m. would be a vegetable soup with bread and cheese or whatever you fancy. We end the day with giving the donkeys straw for the night and taking the dogs for a walk while others take care of the kitchen. What can you expect when you want to volunteer at “Paraíso del burro”? Tanja (a volunteer from Sweden) said while driving through the metal entrance gate when I arrived “Whatever you expect, you won’t be disappointed”. What a huge compliment- and she wasn’t exaggerating! 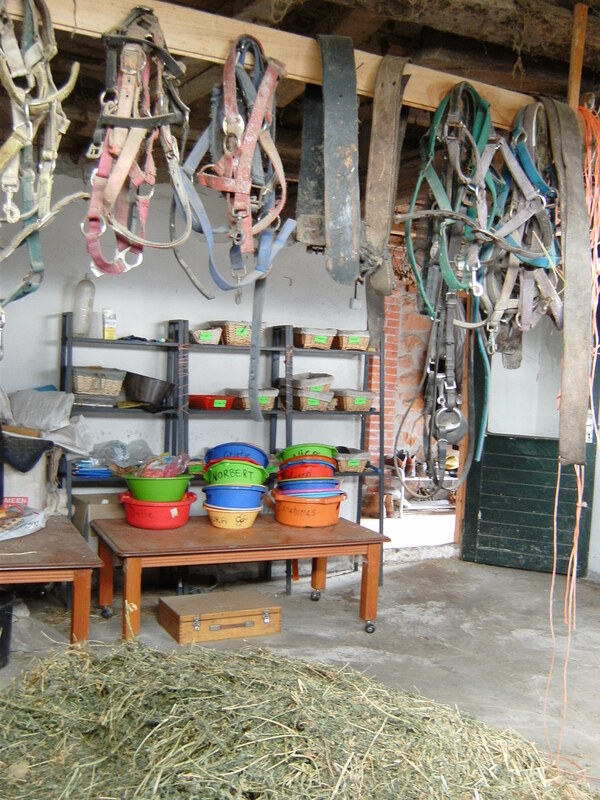 Wwoofing seems to be an easy concept- working on a farm in exchange for board and lodging. 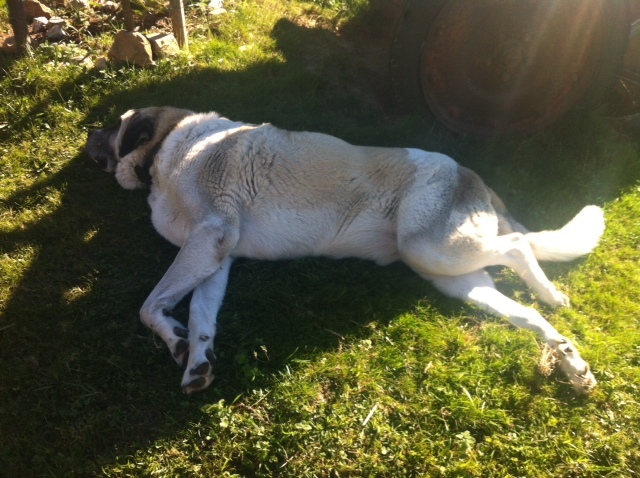 In reality, every wwoofing farm differs of course significantly in the work that has to be done, the sleeping place and the food. One opportunity of Paraíso are the different tasks that have to be done. 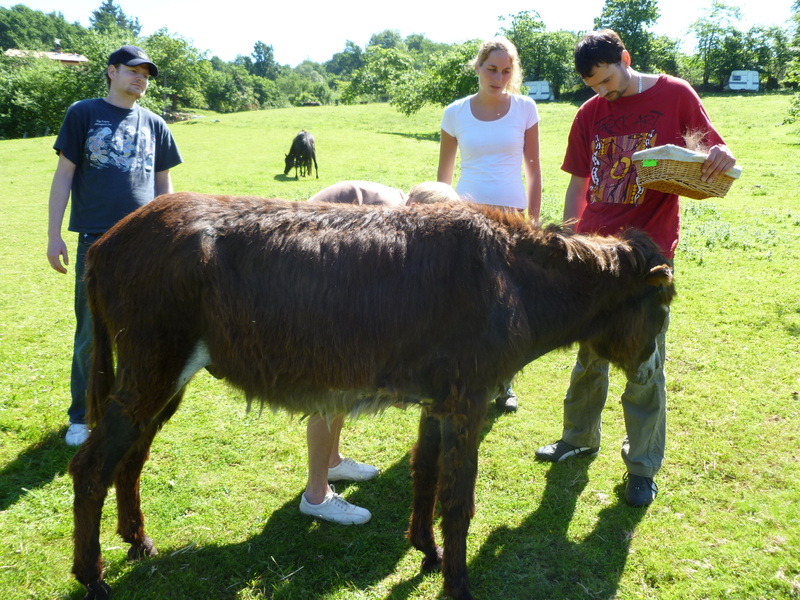 The animals require caring and feeding, filling the water buckets, cleaning the stables and of course the donkeys have to be brushed and caressed! 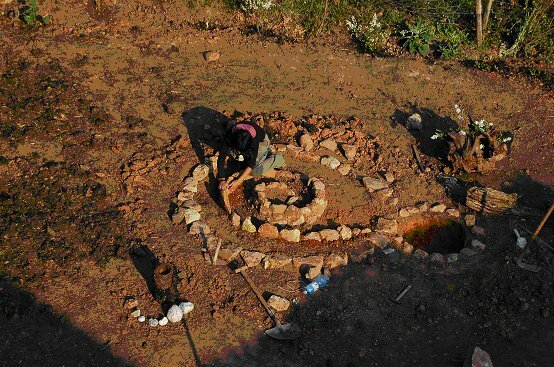 As we are still building Paraíso the work also includes fencing with mesh wire or wooden board, building a flower garden next to the house and also general maintenance, like spreading the dung between the apple trees or planting and weeding in the vegetable garden. There is the housework: like getting water from the public water tap at the “area recreativa” with its spectacular views, shopping in Arriondas, baking bread, making yoghurt, cooking meals and cleaning the house. After all the work you will be able to enjoy the fantastic vegetarian kitchen of this house! The meals are creatively cooked with plenty of fresh vegetables and commonly eaten at the big wooden table in the living- room with its fantastic views. Why self – made volunteering? In Paraíso you will be asked to choose and organize your work on the tasks you would like to fulfill during your stay yourself, although there is general work that has to be done by everybody. In the evening you might sit in front of your sleeping caravan on the donkeys’ grazing land, enjoying the stars and the sound of the neighbour’s cowbells, and know that you arrived- at the paradise of the donkeys.